Equally well-suited for plein air and studio settings, Princeton Aspen brushes combine performance, practicality, and style. 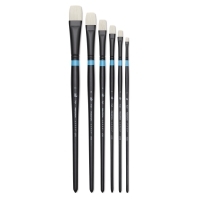 Available in a wide variety of sizes and shapes, Princeton Series 6500 Aspen Synthetic Brushes are made using synthetic bristles that possess the same stiffness as natural bristle. 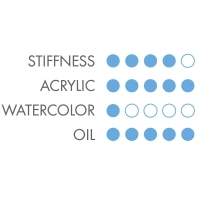 Unlike natural bristle, however, the brush hairs stay together regardless of the painting surface or the degree of pressure applied, allowing control and precise placement of color. 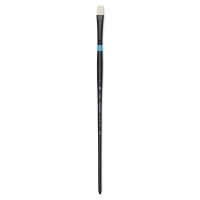 Acrylics, oils, and watersoluble oils release and glide evenly off these brush hairs. 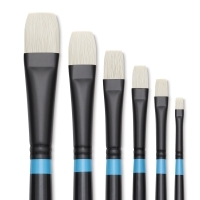 Every Aspen brush has an elegantly polished black handle made from reforested wood, and a matte black ferrule that eliminates light reflection when painting on site.